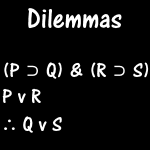 Existential Instantiation and Existential Generalization are two rules of inference in predicate logic for converting between existential statements and particular statements. Watch the video or read this post for an explanation of them. ∴ Some pets are not skunks. This is valid, but it cannot be proven by sentential logic alone. We need to symbolize the content of the premises. 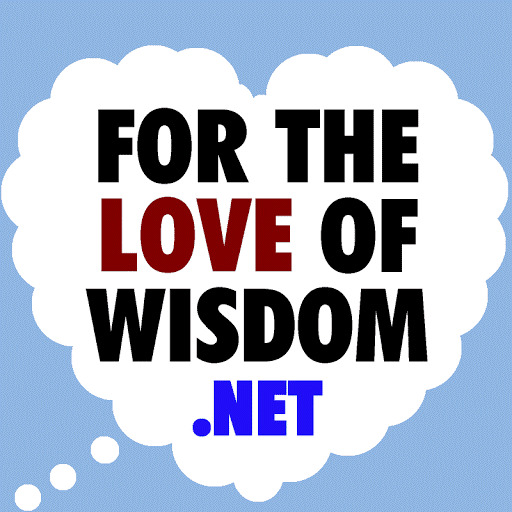 The first premise is a universal statement, which we've already learned about, but it is different than the ones seen in the past two lessons. This one is negative. Instead of stating that one category is a subcategory of another, it states that two categories are mutually exclusive. The next premise is an existential premise. It asserts the existence of something, though it does not name the subject who exists. Unlike the first premise, it asserts that two categories intersect. This is the opposite of two categories being mutually exclusive. A statement in the form of the first would contradict a statement in the form of the second if they used the same terms. The conclusion is also an existential statement. Unlike the previous existential statement, it is negative, claiming that members of one category lie outside of another category. Using the same terms, it would contradict a statement of the form "All pets are skunks," the sort of universal statement we already encountered in the past two lessons. With this symbol in hand, we can symbolize our argument. Here is a proof of it. 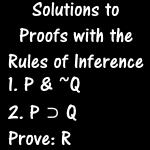 This proof makes use of two new rules. In line 3, Existential Instantiation lets us go from an existential statement to a particular statement. In line 9, Existential Generalization lets us go from a particular statement to an existential statement. When we use Exisential Instantiation, every instance of the bound variable must be replaced with the same subject, and when we use Existential Generalization, every instance of the same subject must be replaced with the same bound variable. The bound variable is the x you see with the ∃ symbol. It doesn't have to be an x, but in this example, it is. 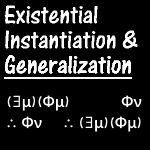 Notice that Existential Instantiation was done before Universal Instantiation. This is because of a restriction on Existential Instantiation. 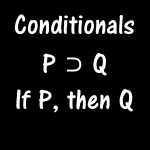 Whenever it is used, the bound variable must be replaced with a new name that has not previously appeared in any premise or in the conclusion. This is because an existential statement doesn't tell us which individuals it asserts the existence of, and if we use the name of a known individual, there is always a chance that the use of Existential Instantiation to that individual would be mistaken. Whenever we use Existential Instantiation, we must instantiate to an arbitrary name that merely represents one of the unknown individuals the existential statement asserts the existence of. Because of this restriction, we could not instantiate to the same name as we had already used in a previous Universal Instantiation. If we are to use the same name for both, we must do Existential Instantiation first. To better illustrate the dangers of using Existential Instantiation without this restriction, here is an example of a very bad argument that does so. ∴ Something is both a dog and a cat. 3. Dh // 2 Existential Instantiation? In this argument, the Existential Instantiation at line 3 is wrong. Since Holly is a known individual, we could be mistaken in inferring from line 2 that she is a dog. Since line 1 tells us that she is a cat, line 3 is obviously mistaken. But even if we used categories that are not exclusive, such as cat and pet, this would still be invalid. And, obviously, it doesn't follow from dogs exist that just anything is a dog. You're not a dog, or you wouldn't be reading this. There is no restriction on Existential Generalization. The name ν must identify an arbitrary subject, which may be done by introducing it with Universal Instatiation or with an assumption, and it may not be used in the scope of an assumption on a subject within that scope. The name ν must be a new name that has not appeared in any prior premise and has not appeared in the conclusion.